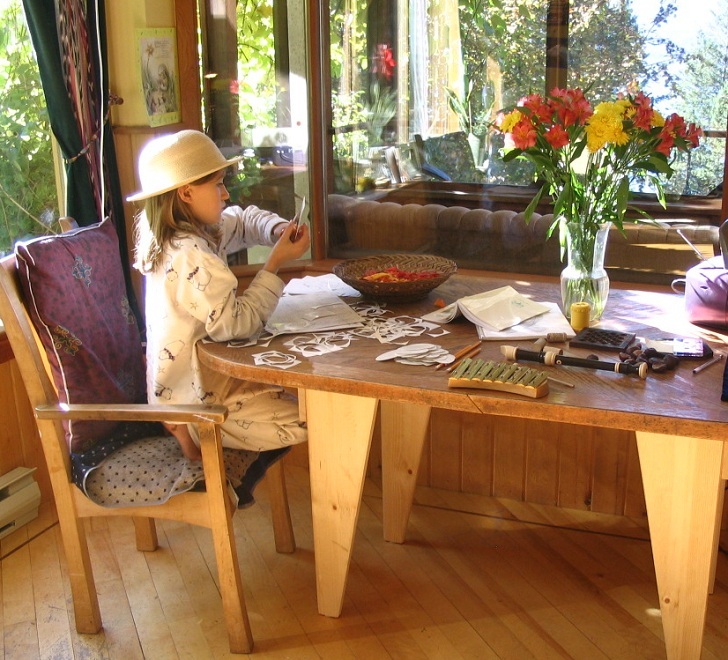 Twenty years ago, our family was introduced to the art of creating Nature Tables from Waldorf Education. A Nature or Seasonal Table is a table or a shelf in your home where, together with your child, you craft beautiful scenes that reflect the rhythms of the seasons outside. The benefits of this practice include: contributing to healthy childhood development, combating nature deficit disorder and cultivating the bonds of your family. Read on to learn more and gather tips for creating these simple, whimsical scenes for your home! Searching for special treasures and tending a Seasonal Table is an absorbing, soothing and creative activity for your children. The acts of finding natural objects, crafting items and caring for the scenes gently and intuitively fosters your child’s connection with nature. In our home, our table naturally drew the children to it when we came home from an outing — often with a contribution for the Nature Table! It’s presence inspired them and sharpened their observational senses when we were out on an adventure. Items for Seasonal Tables can be as simple as bits and pieces of nature that that you find on an outing to the park: feathers, cones, bark, branches, berries (don’t eat! ), and flowers. Add household items like artwork, bowls and vases. Do craft projects with your children to make items for your table, such as, fleece fairies, small wool dolls, felted or knitted creatures and watercolor paintings. You can also buy non-toxic wooden animal figures, postcards, natural cloth, crystals and beautiful felted characters for your tableau from an online site and at Waldorf School craft fairs. 1) Set up a sturdy table or shelf. If your children are very young, place out of reach. 2) If you like, spread out a cloth made of a natural material; silk, wool or cotton, in an autumn shade like orange, tan or yellow. This cloth is the ground for the scene. An alternative is to use a wood or stone surface. 3) Place blocks of various sizes beneath the cloth, if you used one, to give dimension to the scene and surfaces to place objects on. Consider the possibility of hanging objects (like seasonal fairies) from the ceiling above. 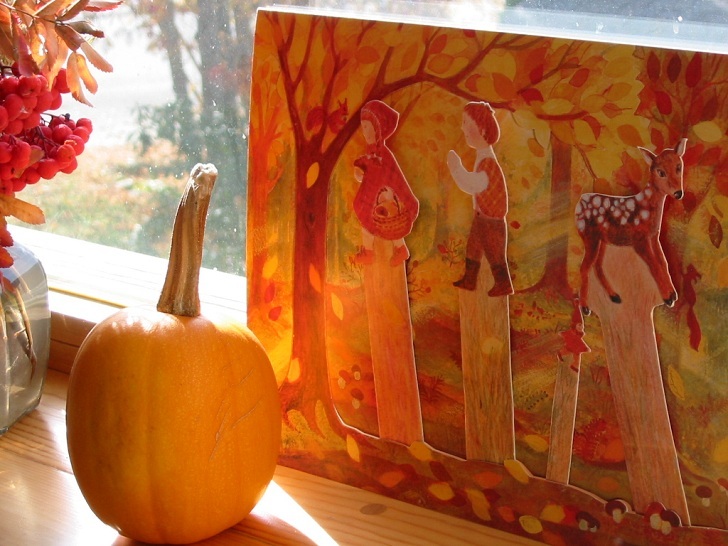 4) Share a story or simple poem about Autumn with your children. Here’s an example of a seasonal poem. Fruit from the orchard all ripe, red and gold. Log for the fire to keep out the cold. 5) As you say the poem, set up a simple fall scene. 6) In the ensuing weeks of the season, you and your children can gather natural objects to contribute to your scene. Special autumn items include; husks, harvest flowers, mushrooms (don’t eat!) and seed pods. You can knit or purchase whimsical natural wool animals, felt gnomes, fleece fairies and felted woolen landscapes. 1) Value simplicity. Keep your table uncrowded. Identify an outdoor area (we called ours the “Find Garden”) that has the purpose of housing extra nature items that don’t fit inside on your Nature Table. 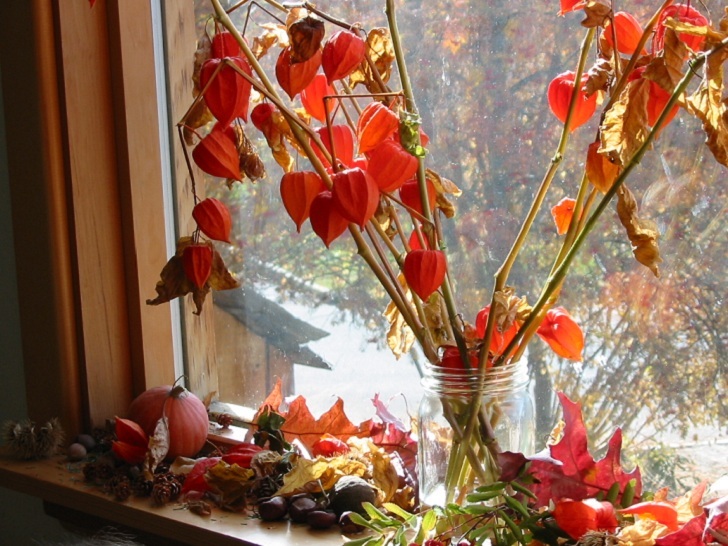 3) Freshen up the seasonal theme of your tableau regularly, this mimics changes in nature. 4) Model care and respect of the Seasonal Table objects for your child. 5) Keep elaborate adult explanations about nature to a minimum! Children best learn about nature through experiential, story-telling and intuitive ways. 6) Colors are important because they express the moods of the seasons. The hues for your autumn Nature Tables are; warm red, fiery orange, orangey-yellow, tree bark tan, earthy brown and mouse grey. Examples of winter colors are; cranberry red, snow white, dark water blue, royal purple. Spring colors are; delicate green, lemony yellow, creamy white, soft skies blue. Summer colors are; butterscotch yellow, verdant green, poppy flower red and Robin’s egg blue. 7) Have fun with your children and your Nature Table! I love this. Our girls look so forward to bringing goodies in from our hikes and playtime outside to put on display. It's something we all look forward to creating together to honor and mark the changing of the seasons. A Waldorf inspired Nature Shelf can be as simple or as elaborate as you like. Think of it as a celebration of the cycle of nature. A storyboard painting offers the opportunity to tell stories about fall adventures. Do craft projects with your children to make items for your table like; fleece fairies, small wool dolls, felted or knitted creatures and watercolor paintings. Searching for special treasures and tending a Seasonal Table is an absorbing, soothing and creative activity for your children. The acts of finding natural objects, crafting items and caring for the scenes gently and intuitively fosters your child’s connection with nature. Making craft projects together with your children is a soothing and bonding way to forge family memories. Colors are important because they express the moods of the seasons. The hues of your Autumn Nature Tables are; warm red, fiery orange, orangey-yellow, tree bark tan, earthy brown and mouse grey. Examples of winter colors are; cranberry red, snow white, dark water blue, royal purple. Spring colors are; delicate green, lemony yellow, creamy white, soft skies blue. Summer colors are; butterscotch yellow, verdant green, poppy flower red and Robin’s egg blue. Keep elaborate adult explanations about nature to a minimum! Children best learn about nature through experiential, story-telling and intuitive ways. 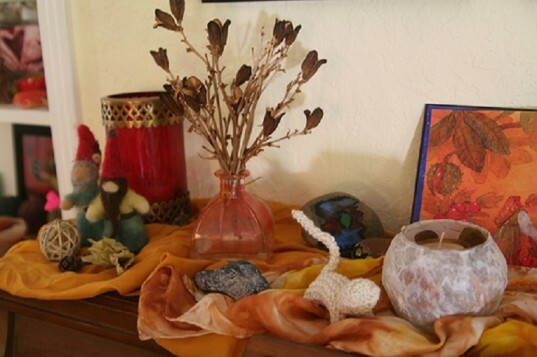 A fun and easy craft project is to wet-felt wool around river stones for your Nature Table. Natural variegated yarn to knit or crochet whimsical figures. Items for Seasonal Tables can be as simple as bits and pieces of nature that that you find on an outing to the park; feathers, cones, bark, branches, berries (don’t eat! ), and flowers. Our garden and yard supplies many natural and beautiful contributions to our tableau. Consider the possibility of hanging objects (like seasonal fairies) from the ceiling above. A felted wool scene with a river, a cave, stones and a flowered meadow provide the perfect landscape for a Nature Table. More elaborate and beautiful felted pieces can be purchased from artist websites like www.dreamtolife.ca. Homemade watercolor paintings make vivid backdrops for the Nature Table.